Booking a train ticket on IRCTC can be a daunting task and if your ticket is still on the waiting list then the process is even more frustrating. But the good thing is, If your waiting list number is not too high, chances are your ticket will get confirmed before the train chart preparation. This makes the chart preparation an event to keep an eye on. There are many misconceptions and queries about train chart preparation time. Here we present you the complete process of charting and if you got any queries it will be solved by the time you finish reading this article. Train Chart Preparation Time is important when you book train ticket and if you get Waiting list for that. So if you want to know whether your name is in the final list of the passenger in the reserved category or not. Then it is finalized at the chart preparation time. So it is necessary to know the Railways chart preparation time. Suppose you booked a ticket in tatkal and you got 37 Waiting List (W/L), now either keep checking whether your ticket is confirmed or not. Or wait for Chart preparation, because if your ticket is not confirmed till chart preparation, then you have to travel without a reserved seat. If you booked the ticket online, your waiting list ticket will get canceled automatically. You can not travel with an e-ticket that is not confirmed. The refund for the canceled ticket will be refunded automatically to your account without the need of performing an extra step. And if you have booked your ticket online and if it is on the waiting list after chart preparation then your ticket will auto cancel. Check Train ticket cancellation rules for that. 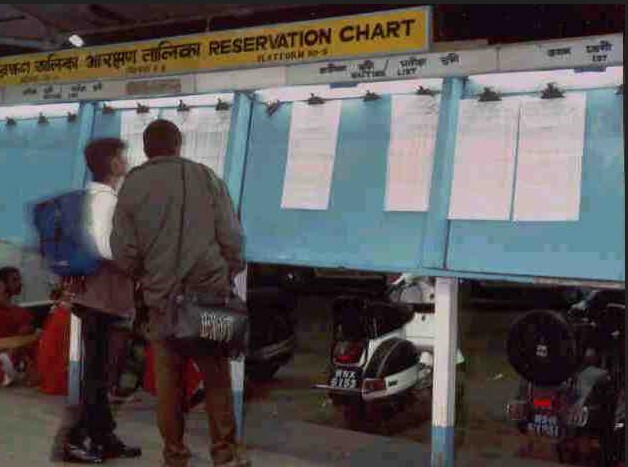 The chart preparation of train depends on its departure time, for every train Chart preparation time is different and it also depends on whether train departure time is in morning or evening. According to the official website of IRCTC, charting is done is prepared 4 hours before its scheduled departure from Originating station. For trains departing in the early morning, the process is completed the night before. Though the chart prepared is not final and can still be altered by railway. The final chart is prepared 30 minutes before the departure of the train, in the final list people having RAC tickets could be confirmed. So it is always a best practice to wait for until 30 minutes before train departure. What is Chart of Train ? A train chart is the list of passengers that have reserved the seat on that train with all of their details like Name, Gender, Age and station of boarding and destination. It also consists of Coach and seat number of the passenger with confirmed ticket and RAC. This chart is usually pasted on notice board of your train platform or at your coach. When you check PNR status, you may have found this message Chart not prepared. You must be thinking what does this means. As I told earlier if you have your seat in the reserved category or confirmed then you do not need to worry about this chart preparation. But if your seat is on the waiting list or RAC then you have to wait till chart preparation, as only after chart preparation, you will get to know whether your seat is confirmed or not. If your seat got confirmed at the time of chart preparation, you will get your seat and coach number on the chart. Otherwise, you will be on waiting list. Note: From Nov 12, You can book online ticket 30 minutes prior to train departure. And the chart will also be prepared two times. One before 4 hrs of scheduled departure and another 30 minutes before the scheduled departure. Generally, the chart for morning train (i.e train before 11 A.M )is prepared on the previous day before 8 P.M, but it also depends on the origin station working criteria. So if you are leaving through some morning train, then your chart will be prepared on the previous evening, so it would be easy for you to get to know whether your seat is confirmed or not. As I told earlier for trains chart are prepared before 4 hrs of its departure time, so all the train in evening their chart is prepared for about 3-4 hours before it leaves. If your train is in midnight or early morning then your train chart will be prepared in the evening at 8 P.M.
How to check Whether Chart is prepared or not? To know whether your train chart is prepared or not. You need to have your PNR number, now just do PNR status check on Indian Railways site or on IRCTC. There you will get to know complete details, weather chart is prepared or not. Or your ticket is confirmed or not. You must keep in mind that train chart is prepared before its departure from origin station, so sometime you may come across a situation that train chart is prepared 1 day from your time. As it might be a case that train origin is from some far station, so while checking chart preparation or PNR status, it is also important to know train origin station and it’s timing. You can check chart prepare or not by doing PNR status check on Indian Railway website or if you have book online on IRCTC, then just do PNR status check online on our irctc account directly. I hope you are now clear about the chart preparation timing of train. If you want to ask anything else related to INDIAN railways or IRCTC. Just comment here we will definitely answer your query. I have 2 tickets which after 1st chart prepration shows status waiting list 1 and 2….. my train will depart on 11 a.m so my question is… should I wait for the second chart which will be prepared half an hour before departure… in hope that my ticket will get confirmed or not?? I have got a confirm ticket(it was confirm right at the time of booking) still I can’t see my coach and birth number. On checking PNR Status it shows Chart not prepared. Why such? I have got a tatkal waitlist ac3 ticket.after chart prepared it is not confirmed.my train is at 08.00am.how can I cancel it because as per rule I can cancel the ticket only 30minutes before departure of train as the prs counter will open at 08.00am only. My train is supposed to leave at 20:45 from delhi, its a rajdhani and the chart has not been prepared till 19:10. My pnr status is showing wl5 even after chart is prepared. How is this possible? Because once as I was told by a friend, the waiting list tickets which were booked online will be cancelled automatically after chart preparation. Please reply at the earliest. Don’t worry. It will get cancelled automatically and you will be notify with mail and SMS. I have booked a reservation for boarding from Surat by train which originates from Okha at 7.45 in the morning. The ticket is in w/l. Even at 4.00 pm the PNR status shows CHART NOT PREPARED. Thr train No. is 18402. Pl. guide me. I have booked a reservation ticket from GUDUR JUNCTION via 12642 Thirukural Express on 29/05/16 Sunday,I thing this train is departed by today morning around 7.15 AM But i check my PNR status showing WL 18/19 & CHART NOT PREPARED. Pl suggest to me If my ticket will be confirmed or not and when will be chart prepared & what time? Based on result i will plan alternate travel. We are traveling to to dindugal on 12th Aug 16 with 1.5 Yrs kid. below is the PNR status. Can you suggest us wheatear below ticket will be confirmed or should i have alternate option. i just have a enquiry about tatkal tickets..
what will happen if one gets confirmed and another one not.. In this case other passenger can travel but he/she will not get the seat until his ticket confirm. RAC means Reservation Against Cancellation.Mine is RAC 1….Does it mean my ticket gets cancelled automatically if it is not confirmed. How many Chances of getting confirm? ?it wil get confirm? I HAVE TAKEN TICKET THRU’ ONLINE FROM IRCTC AND TICKET ON WAITING LIST CONDITION, SUPPOSE TICKET WONT CONFIRM THEN WHAT WILL HAPPEN WHETHER TICKET WILL BE AUTO CANCELLED OR REMAIN WAITING LIST CONDITION. I have booked tatkal for May 7, 2016 in train bangalore EXP 16525. It’s in TQWL 6&7. However it’s still says chart not prepared. Can I know when will the chart be prepared.? Please read the article carefully. If train is late then whether the chart will be prepared on late time or original departure time…..urgent plz answer as soon as possible…. Todays rajdhani mumbai to delhi….waiting 4,5,6 How many Chances of getting confirm? ?it wil get confirm? hi, i booked ticket on 19/5/17 and journey on 16/9/17, ticket came waiting list pqwl3 and pqwl4, train timing is evening 6 pm, when chart will be prepared, can u tell the time of chart prepared. Ticket lost in waiting. Now what I do… Please help….